Washington DC – Saudi King Salman Al-Saud plans to abdicate his throne and install his son Mohammed as king, multiple highly-placed sources told the Institute for Gulf Affairs. Mohamed bin Salman is the current deputy crown prince, second in-line to the throne, and defense minister. King Salman, 80, has been making the rounds visiting his brothers seeking support for the move that will also remove the current crown prince and American favorite, the hardline Mohammed bin Naif from his positions as the crown prince and the minister of interior. 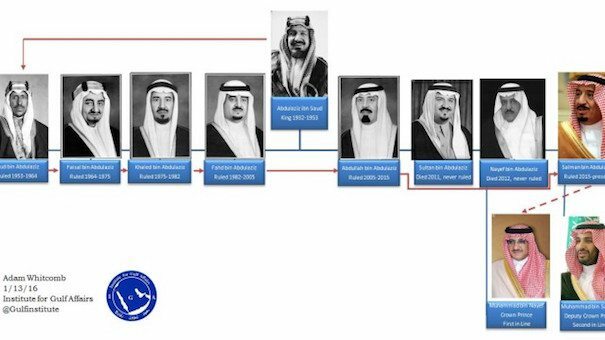 According to sources familiar with the proceedings, Salman told his brothers that the stability of the Saudi monarchy requires a change of the succession from lateral or diagonal lines to a vertical order under which the king hands power to his most eligible son. Since the establishment of Saudi Arabia as an absolute monarchy in 1932, the throne was handed down from the founder King AdbulAziaz to his son Saud, then to his brothers Faisal, Khald, Fahd, Abdullah, then Salman, who became king on January 23, 2015. Salman is the last son of King AbdulAziz AlSaud to rule as king of Saudi Arabia. AbdulAziz is the only man in history who served as king and fathered six kings. The current arrangement is that the throne will go to the nephew of King Salman, interior minister Mohamed bin Naif, who has been slowly marginalized by his younger cousin and the king’s son, Mohamed bin Salman. The sources said the king referred to the Jordanian monarchy that changed its succession order to eliminate transfer of power between brothers and moved it to a vertical succession order. Bin Naif has two daughters and no male children due to his purported cocaine habit which affected his fertility. Mohamed bin Salman has two daughters and two sons, Salman and Mashoor. In April 29, 2015, King Salman removed his half-brother Muqrin from his position as crown prince 94 days after his appointment, and replaced him with his nephew Mohamed bin Naif. The change in succession order at this time seems to be characteristic of King Salman’s many brash decisions during his first year of rule including waging war on Yemen, shrinking the budget, mass executions of dozens including Shia religious leader and dissident Sheikh Nimer AlNimer for political activities earlier this month, and starting a spat with Iran. Salman would be the first Saudi king who willingly abdicates and see his own son as king. He would most likely be referred to as father king. A similar move was taken by the former Qatari ruler Hamed bin Khalifah AlThani who abdicated in 2013 and install his son Tamim in his place. Salman plans to abdicate and install his son as king while he is still alive to guarantee his offspring would not be marginalized and driven out of power like all the sons of former Saudi kings who lost power and influence after the death of their fathers. 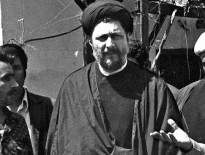 The sons of Kings Abdullah, Fahd, Khalid and Saud all lost most of their positions and were relegated to lesser posts, such as provincial governors, after their father kings have passed away. The sources did not give a specific time line for the abdication but believed the matter will be concluded within a matter of weeks. The sources said that the king is spending hundreds of millions to buy support for his decision within the ruling family. Adam Whitcomb contributed to this report.